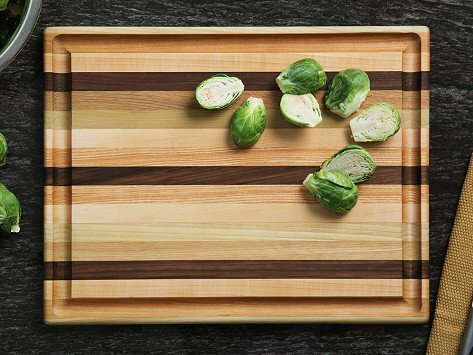 From start to finish, this handcrafted cutting board is made in the Dickinson family’s woodworking shop in Indiana. The board is double-sided with a grooved edge to corral juices. Locally sourced and sustainably harvested wood—like ash, maple, cherry, and coffeenut—is used to make the striking striped design. With proper care, like hand washing and seasoning it with oil, this beautiful board can last for many years. Dimensions: 8.25" x 10" x 0.75"; 12.5" x 16" x 0.75"
Weight: 8.25" x 10": 1.3 lbs. ; 12.5" x 16": 3.4 lbs. Exactly as described. No two identical. Beautiful woodwork--I bought one for a gift and one for myself. This was given as a wedding gift; beautiful and practical. Small size not useful as a cutting board. Very disappointed with size. My question..what meat product could you crave?? Not a roast, unless it was for one or two. The product is gorgeous,oduct is gorgeous, perfect craftsmanship. A piece of art. I will let my son review product and decide if we keep.